Well damn it. Yes I must admit that I'm a bit dissappointed to have to admit this, as I for one am already starting to drool about the Samsung Galaxy S3. 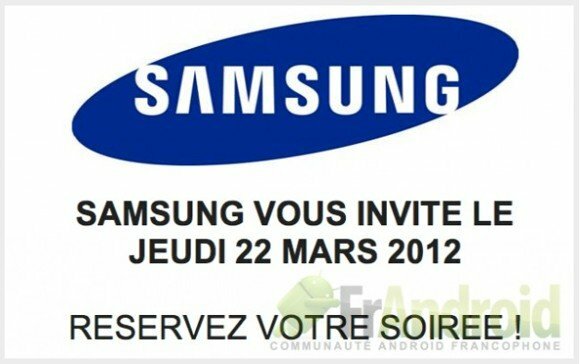 Yesterday we reported on a breaking event about Samsung sending invites to an exclusive event taking place in Paris on March 22nd, and speculated that this event would seem like a logical location to launch the newest Galaxy device. Unfortunately, we now have a 150% concrete update to confirm that the device will NOT be launched next month in Paris. The hype about this device and where it will NOT debut is starting to get quite crazy, and I'm sure Samsung is pleased that it's generating such a buzz in the tech world. I'm still quite interested to know WHAT will be unveiled at the event next month, as I'm sure Samsung isn't holding it for nothing. So if it's not launching at MWC in Barcelona, and if it's definetly not launching at the exclusive event in France, where, and more importantly WHEN can we expect to see this device released! As much as I hate to see yet another opportunity that Samsung will NOT use to launch the phone, I have to admit that in a way it's making me more and more excited about the actual release! Expectations are getting higher and higher for this device, and despite all the hype, I have a good feeling that they will be met. We'll keep you guys updated as we receive more information. could be Samsung 11.6 inch tab? A tab is a possibility... there still is the possibility of the Nexus Tablet that has been rumored for years. Maybe they'll finally confirm that it exists? That would be worth the delay on the Galaxy S3 in my book! MEEEEEEEEEEEE TOO. A new tablet maybe? Yeah, now I'm also really interested to know WHAT they are announcing next month!